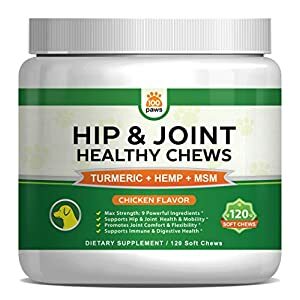 NATURAL JOINT SUPPORT: Our All Natural pet canine Hip & Joint soft chews support joint health & mobility, promote comfort and flexibility, and support immunity & digestion. We include Turmeric to help relieve inflammation, and naturally help reduce pain & discomfort. AMAZING BENEFITS OF HEMP: Our unique formula helps decrease arthritis symptoms and inflammation. We include Hemp Seed Oil, which contains Omega 3 6 and 9, helps decrease pain, improves sleep patterns, supports heart & brain health, relieves stress and anxiety, and supports healthy hair, skin and nails. 9 POWERFUL INGREDIENTS: Our pet canine soft chews contain Turmeric Curcumin, Glucosamine, Methyl Sulfonyl Methane (MSM), Hemp Protein, Hemp Seed Oil, Chondroitin Sulfate, Vitamin C, Ginger Root, and BioPerine (black pepper extract).